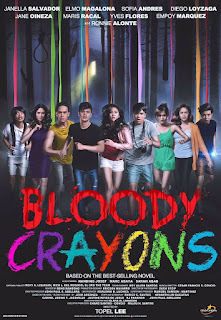 Bloody Crayons, a suspense – thriller film under Star Cinema Productions, an original novel by Josh Argonza published at Wattpad starring the new generations of actors and actresses Janella Salvador, Elmo Magalona, Maris Racal, Jane Oineza, Sofia Andres, Diego Loyzaga, Yves Flores, Empoy Marquez, and Ronnie Alonte. Directed by Topel Lee and released last July 12, 2017. A horror film involving a group of graduating students that is about to enter a horrifying situation. 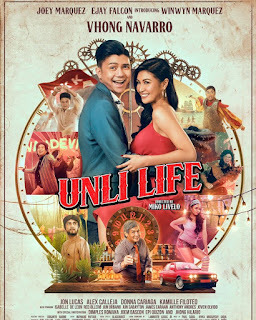 These graduating students Eunice Nicolas (Janella Salvador), Kiko Rivera (Elmo Magalona), Richalaine Alcantara (Maris Racal), Olivia Mendez (Jane Oineza), Marie Ragman (Sofia Andres), Kenly Sy (Diego Loyzaga), John Jose (Ronnie Alonte), Justin Ybanez (Yves Flores) and Gerard Anderson (Empoy Marquez) visited an island for their summer vacation. After settling, they started a short film and one of them suggested to play a game called bloody crayons. As they start to play, series of unfortunate events happened and the killings started as well. One by one they’re being murdered by a mysterious killer. Friendship will be tested and finding the real killer must be identified before all of them are dead. All casts gave a justifiable performance in each characters they played especially Elmo Magalona and Janella Salvador. Another psycho – thriller film that I will recommend to those who enjoys this kind of movie genre.